£250 OFF Invisalign if attending our OPEN DAY! We have recently added the Invasilgn Adult Teeth straightening system to our private treatment options. 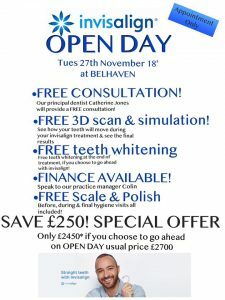 To launch this additional service we are having an open day at Belhaven where you can have a 3D scan of your teeth with an instant simulation to see how your teeth will look after the Invisalign process. We’re having the INVISALIGN open day on Tuesday 27th November! If you decide to go ahead with treatment on the day, you will enjoy a special price of £2450. Further details of the offer are shown on the image attached.